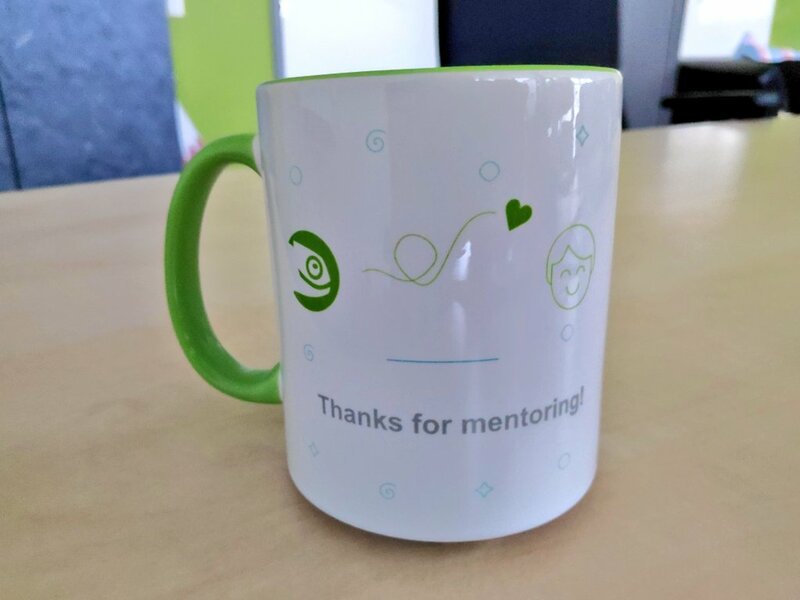 One more year, Google Summer of Code (GSoC), a mentoring program in which openSUSE helps university students contribute to open source project, has come to an end. So, before 2018 ends as well and we start preparing for the new edition of GSoC, it is time to speak about all the great things that happened this year. Let’s start by the most important part, our students’ work. Our successful students, Ankush Malik and Liana Xu, have spent 3 months hacking on openSUSE projects, during which they have written a lot of impressive code. But GSoC is much more than code, it is about learning, having fun and becoming part of the openSUSE community. Both Ankush and Liana claim that it has been an inspiring experience and are really thankful for the support they received from their mentors. Last but not least, I would like to thank our passionate mentors and admins who took out time from their busy schedules to guide the students, our motivated students for their willingness to learn and good work, Douglas DeMaio who helped with shipping packages and organization, Google and specifically its open source team not only for the program itself but also for the well organized conference, SUSE for their support (especially economically), TSP which allows our students to attend the openSUSE conference every year, the blog post translators, Pramasta Ramadha and the rest of the designers who helped with the mugs design and everybody else who made this year GSoC amazing. 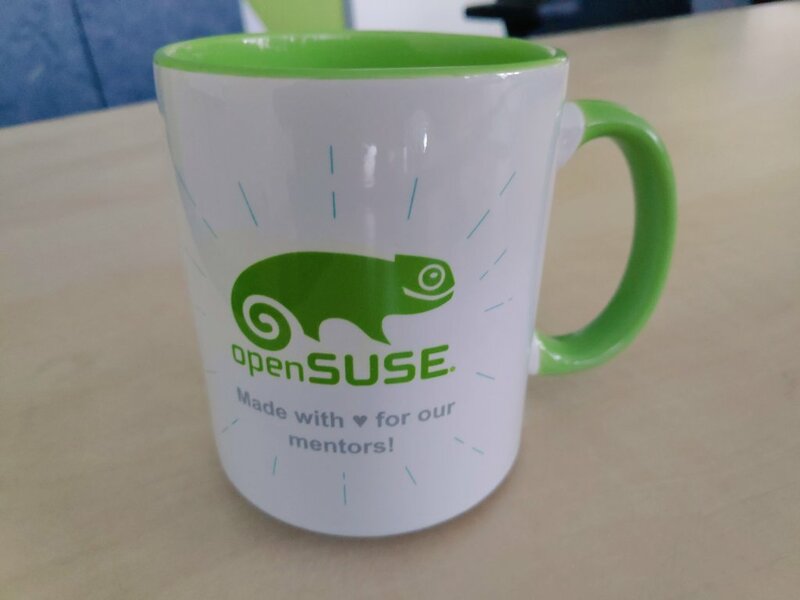 Because of people like you, openSUSE is much more than just software. One of the growing community of openSUSE enthusiasts in Indonesia has contributed a poster he designed for the 2018-2019 Board Elections and Membership Drive. 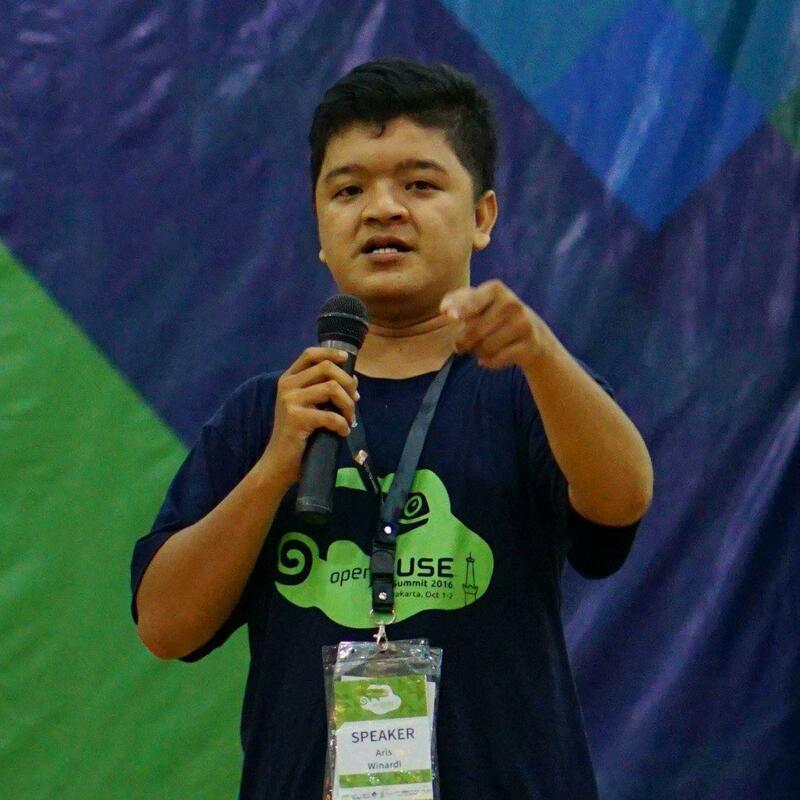 Aris Winardi, from Bogor, West Java, Indonesia, wants to inspire the openSUSE Community and Members to get involved in the Elections process and make it the best one yet. The goal is to encourage all from the Community who are Contributors to the Project to apply for and get their openSUSE Membership, which will give them the right to vote in the upcoming elections and also some extra recognition of the work they do to keep the Project alive. There are currently three of the six seats up for election to the openSUSE Board, with no declared Candidates at this time, giving the opportunity to help guide the current and future path of the organization. This year, the Elections Committee wants to exceed that record, and has announced an eight-week Membership Drive to coincide with the first five weeks of the Candidate Nomination phase, continuing through the three-week Campaign phase that follows. With that in mind, the Elections Committee, along with the help of enthusiasts such as Aris, would like all openSUSE Users who appreciate the hard work and dedication that goes into the creation of such an awesome Operating System to prompt everyone they know who is contributing to apply for their Membership. A healthy Membership leads to a healthy openSUSE Project. How many contributors do you know? Have you asked them if they are openSUSE Members? Are you encouraging them to take out their Membership, if they are not, or are you suggesting they run as Candidates in the upcoming Board Elections, if they are Members? That is a quick contribution you can easily make to openSUSE starting right now, so you can do your part to pay it forward. The growing Asian Community, including the Indonesian region, is showing great enthusiasm for openSUSE and would like to encourage even more contributions and participation in the Project. There are many ways to contribute, just check the Membership page for a quick list of some of the ways, and check out the contributor portal for more. 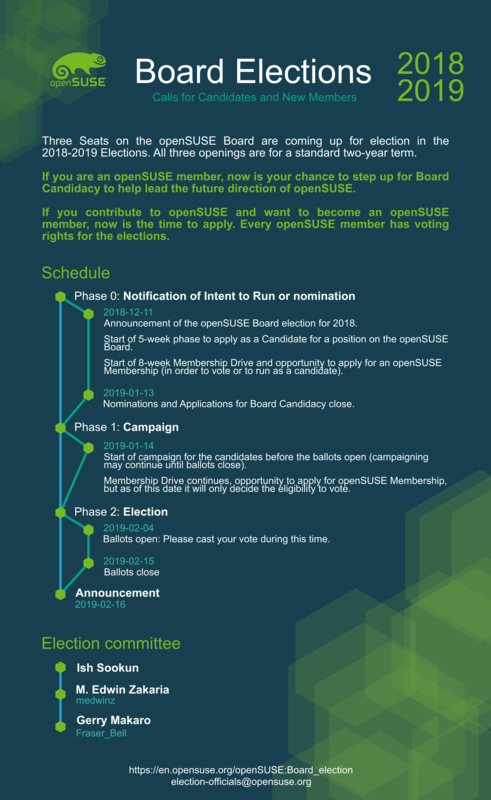 Earlier this week, on Tuesday, Dec. 11, 2018, the Elections Committee posted the Schedule for the 2018-2019 openSUSE Board Elections, along with the announcement of a Membership Drive and a call for nominations and applications for Candidates to fill three vacant seats on the openSUSE Board. The annual Board Elections are normally expected to run in November and December, with ballots cast and results published in time for the newly-elected Board Members to take their seats on the Board at the beginning of January. However, some additional work needed to be completed for this election, and the elections were delayed in part to accommodate the additional work. A healthy Project requires a healthy and energetic Board, and that especially requires a healthy and energetic Membership composed of openSUSE Contributors, both to provide a slate of quality candidates and an enthusiastic group of engaged Contributors, to vote for candidates who best reflect their views for the future and the drive forward of the Project. With that in mind, the current openSUSE Board — at the urging and with the full co-operation of the Elections Committee — clarified and updated the requirements for openSUSE Membership based on earlier engagements with the Community and a subsequent Board vote, as officially required under the Membership Rules, conducted at the annual Face to Face Board meeting earlier this year. The changes to the rules are meant to ensure that all openSUSE Contributors have the opportunity to become a Member and to participate in the Guidance of the Project, as potential Board Candidates and as voters. To encourage more participation in the Project, the Elections Committee announced the start of an eight-week Membership Drive in conjunction with the Call for Candidates. All Contributors who are not already Members are urged to apply for Membership, and all Members and Contributors are urged to encourage fellow Contributors and their associates to apply for Membership. 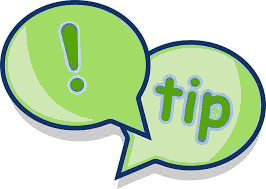 More Members will also mean more Contributors, and more Contributors mean a healthier, stronger Project. The Elections Committee would like to see the entire Community get behind this Membership Drive and participate in this Elections process. For people planning on attending the openSUSE Conference 2019 in Nuremberg, Germany, from May 24 – 26, there are certain requirements necessary to receive a visa for those who are not a citizen of a Schengen country. It’s a good idea to start thinking about getting your visa and this post summarizes the requirements. Please note: the Travel Support Program has no provisions to cover the cost of a visa, so it’s the travelers responsibility for covering the additional cost. For citizens who are not a citizen of a Schengen country, you may need a formal invitation letter that fully explains the nature of your visit. An overview of visa requirements/exemptions for entry into the Federal Republic of Germany can be found at the Federal Foreign Office website. The open-source community has a new project designed to help Linux/GNU distributions with the legal review process of licenses. The new project called Cavil is legal review system that is collectively beneficial not only for the openSUSE Project, but distributions and projects that want to use it. The project provides an add-on service for the Open Build Service. Every OBS request for openSUSE Factory goes through a legal review process to ensure licenses are compatible. Cavil indexes these and creates a legal report for every single request. Bot comments in OBS are made through the legal-auto python script, but the entire project is much larger than the script and bots. Sebastian Riedel and Stephan Kulow have been developing the project for two years and it has been used in production for more than a year and half. The Cavil legal review system replaces an older system and provides much more efficiency. Cavil can automatically accept more than 90 percent of all new requests based on data from previous reviews, so packages are much more streamlined into openSUSE Factory. The project has been so efficient that two lawyers who do all the legal reviews with the system, which is also used by SUSE, had reviewed about 110,000 packages this past year. The same lawyers curated a library with 27.000 license patterns for 600 licenses and 20 license patterns for 100 of the most common licenses that are used to create legal reports. Riedel said there is a desire hope to expand that in the future with the hope of collecting new patterns with the open-source community. The legal Data Base used by SUSE to generate reports with new license patterns is about 2TB and has about 68.433.436 pattern matches in 27.319.682 individual files. Like openQA, Cavil is written in Perl, with Mojolicious/Minion and PostgreSQL. A quick look at the statistics about the content of the legal database showed the most popular open source licenses were GPL-2.0, BSD-3-Clause, GPL-Unspecified and MIT respectively.